At least once in everyone’s life, they have to deal with a dead car battery. Hopefully, most are fortunate to get a jump fairly quickly or find a replacement fast. When you’re down to the last zap of juice in your vehicle’s battery, and you need to buy one quick, does it matter what kind you get? Are all vehicle batteries the same? Not!! Here you’ll find a few key facts about a vehicle battery and what you need to know when purchasing a new one. Size is number one. Not all vehicles are created equal so therefor, neither are their batteries. When locating the right size, make sure to take into account the older battery’s length, width, and height. The new battery needs to fit tight and secure, but not too tight where you’re pushing it in. A comfortable snugness is what it should be. Age of the battery. A “fresh” battery is on that is less than six months old. Check for the manufacturer’s date on the battery. The code they use for the dates is every month has a letter of the alphabet, i.e., A is January, B is February, C is March, etc. The year goes by the last one or two digits of the year, i.e., 2016 would be 6 or 16, 2017 would be 7 or 17, etc. Brand of the battery. A better-known battery brand is going to last longer than a knock-off battery brand. Just because you can find a “new” battery for half the price of a name-brand battery, doesn’t mean you should buy it. 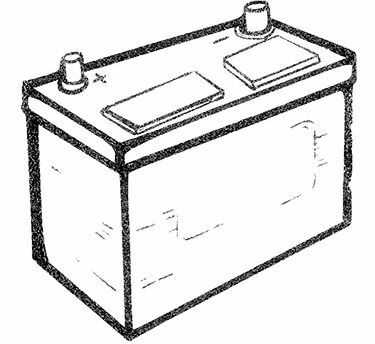 Cheaper batteries can contain harmful components that could alter the life of your vehicle. Buy those kinds of batteries almost always result in more money being spent to repair the damage done thanks to the cheap battery. Check the battery’s reserve capacity. A reserve capacity will help your vehicle run even if the alternator or belts go out. Make sure your battery has a high RC rating that suits your vehicle’s needs; don’t just pick up a battery with the highest RC rating. Weather can affect your battery. Thankfully in Florida, we don’t have to deal with harsh winters, but just like a native Floridian, your vehicle’s battery may have some difficulty with the cold weather we do get. Choose a battery with CA (cranking amps), and not CCA (cold cranking amps). A CCA is for weather zero degrees Fahrenheit while a CA is for 32 degrees Fahrenheit to freezing. Never ever, ever install a used battery yourself. It’s not even recommended by professionals, as it’s just easier, in the long run, to have a new battery put in. It will save you money, time, and a hassle down the road. There you have it; not all vehicle batteries are created equal. Make sure you do your homework when picking out a new battery for your vehicle, this will keep your vehicle running smoothly for as long as it can. If you need any further assistance when it comes to car batteries, call your Leesburg area’s premier retail battery store, Battery Power!